– Use waterproof silicone in any holes you drill. – When using locknuts, prevent cross threading by applying soap on your screws. 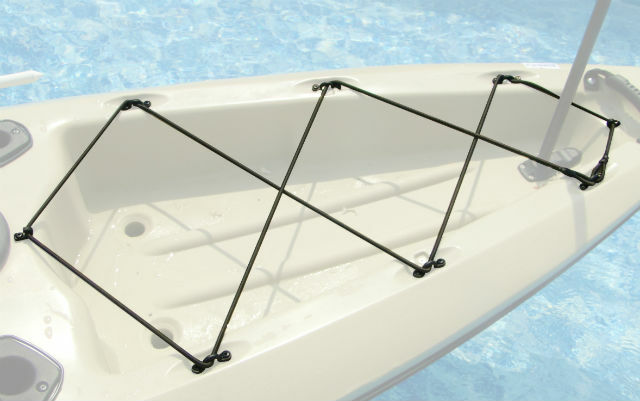 – Make sure you rinse the bungee with fresh water after every paddling adventure. This will increase the product’s lifespan while also keeping it stretchy. – Use a sunblock with high SPF to keep your bungee soft, pliable, and resistant to discoloration. Application is recommended once every 6 months. Pad Eye Placement: Use your pad eyes and J hooks as a template to mark the spots where you want to drill. The pictures show the different threading techniques used in installing deck storage on different size kayaks. Once placement has been determined, use pad eyes as a template to mark drill holes with a sharpie. Pad Eye Installation with Inside Access: Drill 5/32 inch holes where pad eye hole markings were made. Secure screws and locknuts with a screwdriver and pliers. Pad Eye Installation without Inside Access: Drill 3/16 inch holes where pad eye hole markings were made. Secure the rivets with a rivet gun. If you have no inside access at all you will want to pick up extra rivets from the Yak Gear 10 Piece Tri-Grip Rivet it. While it is not recommended, screws and waterproof silicone (without locknuts) can be used in nonweight-bearing situations. Always make sure to use Waterproof Silicone wherever you drill. A combination of with and without inside access installation methods can be used on different parts of the boat, depending on the placement of the inside access vantage points. Bungee Installation: Attach one end of the bungee to any pad eye. To do this, first slip the piece of shrink wrap over the end of your bungee and slide it out of the way. Loop the rope around the pad eye and crimp the end of the bungee to the body of the bungee (approximately 1.5” down from the end) using the hog rings and a pair of pliers. This will result in a permanent bunny ear loop, enclosed with the pad eye in the loop. Crimp the loop closed and then slide the shrink wrap up from the single width rope and over the now double width rope and hog rings. Use a hair dryer or lighter to shrink the shrink wrap, while being careful not to burn the rope. Next, thread the bungee around the first J hook, then through the opposite side pad eye. Cross over to the opposite side, around the J hook to the pad eye most directly across the boat from the original, which has the bungee permanently attached. Continue the threading across to the next pad eye available, on the side that has the original pad eye and bungee permanently mounted. Continue this crossing over method, like lacing a shoe, until finally coming across the second J hook. The second J hook is optional, but allows more give on the bungee when storing bigger accessories. After lacing all empty pad eyes, return to the original pad eye and crimp the bungee as noted earlier. Pull your bungee snug, but not overly tight, as there will be times when a large object is under your bungee and you do not want to overstretch it. Do not stretch past 130% of original length. Use: When using your deck kit, release the bungee from under your J-Hook(s), place the desired accessories in the storage, and clip the bungee back over the J-Hook(s). At the end of your paddle trip, put the bungee back into the J-Hooks and it will help reshape it back to the original size as it dries. Be sure to rinse your boat after every use with fresh water. This will keep your bungee a longer lifespan at the highest standard of flexibility and strength. Video: Still need some visual help? 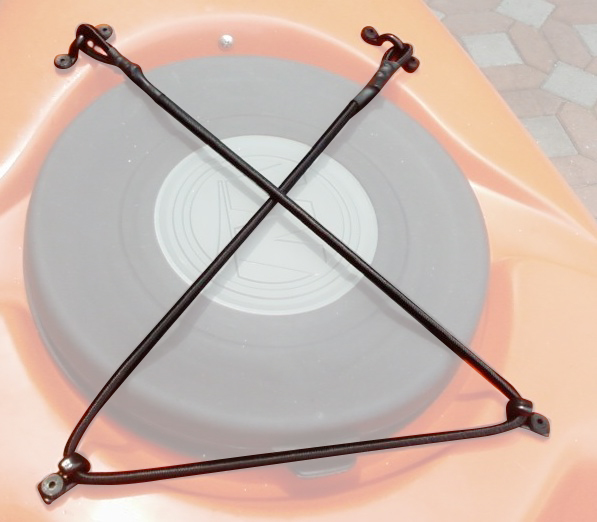 Check out the “How to Install a Kayak Bungee Deck Kit” video below!